Alt Thai News Network ATNN : Thailand: Regime Threatens Terrorism If Elections "Delayed"
Thailand: Regime Threatens Terrorism If Elections "Delayed"
Wall Street-backed Thaksin regime plans to use armed militants if elections are "delayed." Independent red-shirt militants and former supporters of the Pheu Thai Party from the lower Northeast region told the Bangkok Post that weapons and ammunition have been hidden in Bangkok and surrounding areas for some months. "This is not to hit the protesters but to retaliate against a coup and anyone who forces the public and government agencies such as the Election Commission [EC] and the judiciary to postpone the election," said a red-shirt source in Ubon Ratchathani. He said the underground wings of the red-shirt movement were beyond the control or command of any single boss. "There are strong anti-coup and anti-court sentiments among the red-shirt mavericks who are familiar and experienced with weapon use," he said. Thaksin Shinawatra, widely viewed as the de facto leader of the Pheu Thai Party, disagreed with arms stockpiling for fear of being unable to control the militants and their actions, said the source. He said the red shirts have access to heavy arms through sources in the North and Northeast. Cherdchai Tontisiri, a red-shirt core leader in Khon Kaen, said many people back the Feb 2 election. If the military and other agencies intervene in the dispute, red shirts would travel to Bangkok and challenge them. Surely, "delayed elections" is not cause for armed, mass murder. And of course, the premise that a large, coordinated armed movement covertly transferring arms hundreds of miles across the country and into the capital city where they are being secretly staged, all being done "beyond the control" of Thaksin Shianwatra and his regime is not only highly unlikely, it is verifiable false. 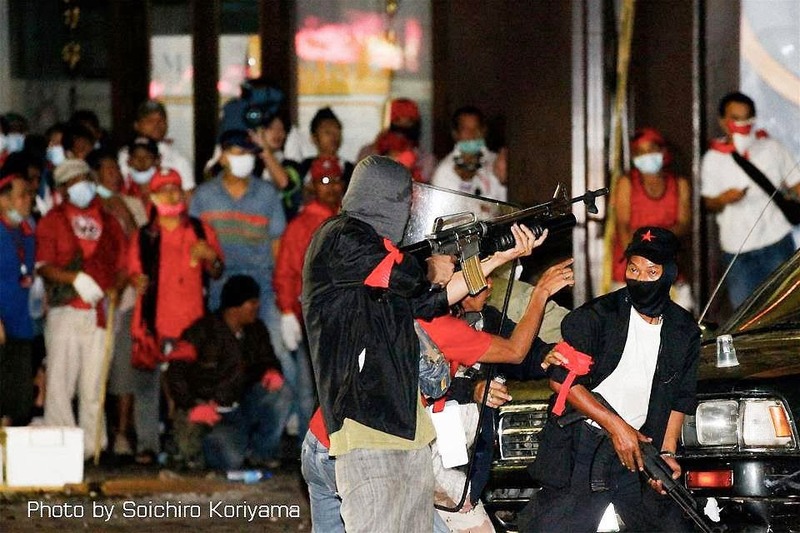 Image: While the regime and its Western backers claim violence in 2010 was the result of a brutal, unprovoked military crackdown on "unarmed" protesters, in reality Thaksin Shinawatra deployed some 300 armed mercenaries onto the streets to augment his "red shirt" supporters. Weeks of gun battles involving the above pictured "men in black," would result in 92 deaths. A similar campaign of mayhem and bloodshed appears to be being planned (and already in the beginning stages of being carried out) now against anti-regime protesters in the streets of Bangkok. On the regime's "Asia Update" TV network, Thaksin's inner circle can be seen on stages up north almost daily, telling mobs that they will "fight the army to the death." 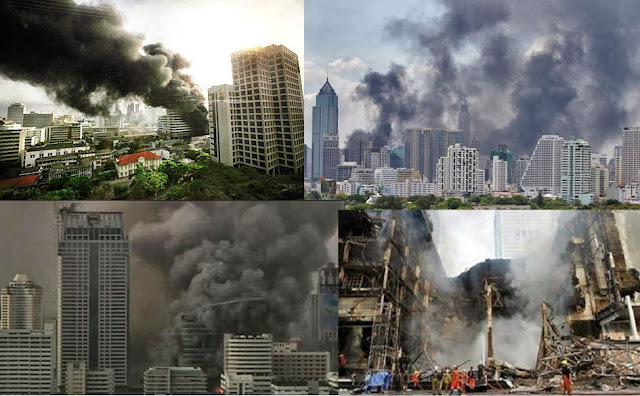 Similar calls were made in 2010 just before a large contingent of some 300 heavily armed, professional mercenaries began fighting the Royal Thai Army in the streets of Bangkok for weeks, leaving 92 dead, thousands injured and scores of buildings in flames after a call for mass arson was made by Thaksin Shinawatra's "red shirt" leaders. More recently threats of covert violence have been made against protesters and heavily armed black-clad gunmen have already been seen working on the regime's behalf during clashes with protesters on at least two separate occasions - on November 30, 2013 and on December 26, 2013. Large, coordinated campaigns of violence require substantial planning, training, and logistical efforts to prepare, and substantial command and control assets to effectively execute. To infiltrate Bangkok with enough to confront Thailand's formidable armed forces would require support not only from the current regime from the highest levels, but support from abroad including Thaksin Shinawatra's significant Western backers, and perhaps from Thaksin's ally, Hun Sen in neighboring Cambodia. With the Washington Post coming out decisively on the side of a regime openly preparing to use terrorism merely if elections are "delayed," bodes poorly for Thailand's future if protesters and whatever authorities are still able to do so, fail to uproot the Thaksin regime quickly, completely, and without compromise. This latest threat is another indictment against the regime, its lack of legitimacy, and the enduring danger it poses to the future of Thailand. The ongoing "Occupy Bangkok" protests seek to oust Wall Street-backed, unelected dictator Thaksin Shinawatra and his nepotist, proxy regime from power.